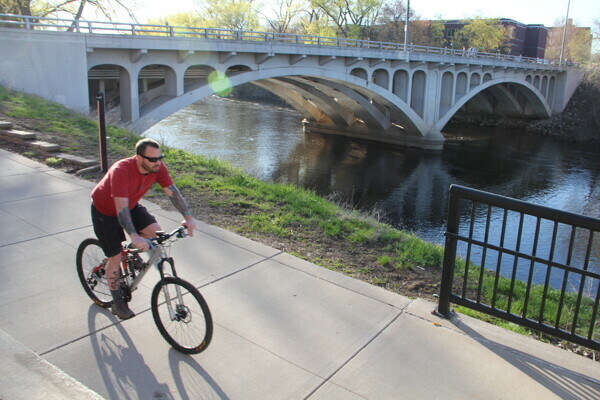 Bicyclists sometimes have difficulty finding a good place to park their wheels while they visit, shop, or otherwise enjoy downtown Eau Claire. To address this problem, last year the city bought a bike corral, a specialized metal rack which can accommodate 10 bicycles in an on-street parking space designed for a single car. However, in an ironic twist, city officials and bicycle advocates are now having a hard time finding a parking spot for the bike corral itself. Last summer, the city and its Bicycle and Pedestrian Advisory Commission (BPAC) approached businesses on Water Street to see if any of them would be willing to allow the corral to be placed on the street in front of their businesses. The Water Street Business Improvement District declined – they offered several off-street options – and the corral was never installed. This year, businesses on South Barstow Street were asked if they’d be willing to play host to the corral for a 90-day trial. Again, the businesses said they weren’t interested. “The primarily issue is just giving up a car parking space,” explains Bob Eierman, BPAC chairman. While Eierman says the situation is frustrating – after all, the corral would allow as many as 10 times as many potential customers to park in the same amount of space – he acknowledges that bike and pedestrian advocates could probably be doing a better job to make their case to business owners who are afraid of losing car-driving patrons. “Once the bike community gets a little more foothold, businesses will realize that catering to the bike community can pay off,” Eierman says. Now, city transportation engineer Leah Ness is exploring alternative locations for the bike corral – perhaps near the L.E. Phillips Memorial Public library or a park. Until a spot is found, however, the $1,000 corral remains in storage, and bicyclists are left locking their bikes to the handful of inverted-U racks on South Barstow. And, if those aren’t available, they’ll be attaching them to railings, poles, or anything else that will hold a bike chain – exactly the reason the city wanted a bike corral in the first place.